Microsoft and Google are two brands that are practically synonymous in tech. Google provides search and email services to billions, while Microsoft’s Office is a ubiquitous presence across college campuses and cubicles around the world. Both companies have long been top destinations in tech but their reputation is rapidly growing within the business world as well. MBAs looking to enter tech may find their dream job at one of these companies. Both Microsoft and Google, unsurprisingly, compensate their employees handsomely. Given the numerous opportunities MBA graduates might have due to their past experience and interests, we will will examine only one position: Project Manager, a common entry-level position for many new MBAs. According to Glassdoor, project managers at Microsoft earn an average annual salary of $96,520, which can rise sharply for MBAs. Average additional play, include cash bonuses, stock shares, and more, can increase the annual sum by a measure of $20,000. 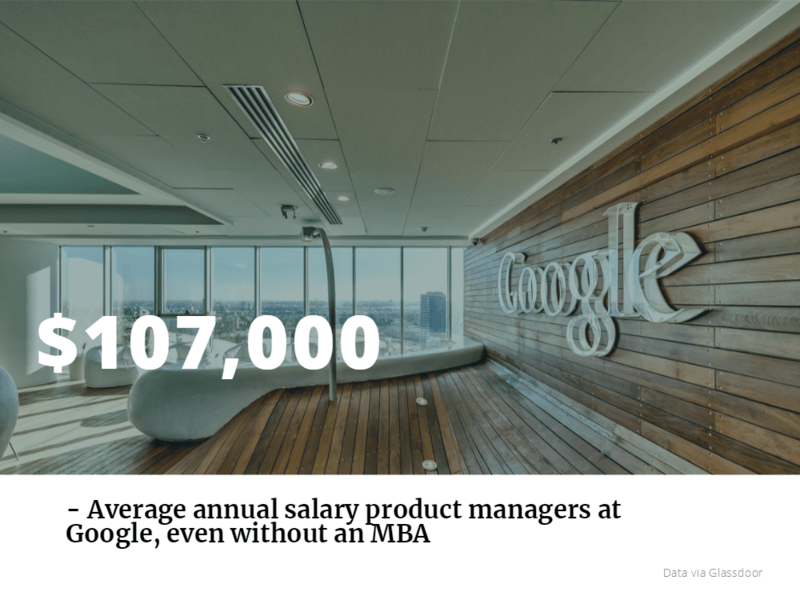 At Google, project managers typically earn a bit more per year, with a current estimate around $107,000. With bonus and stock incentives, that can increase that figure by a measure of $40,000 or more per year. Google has one of the most infamous company cultures in the tech world. Aside from the well-known benefits of working at a Google campus, Google operates according to a philosophy; Ten things we know to be true. This document drives all of the work that the company does. It also influences who they choose to employ at their company. In terms of office life, Google is extremely relaxed. Employees work hard, but they are given the space to do so in their own idiosyncratic ways. Employees are encouraged to be creative by working across departments to develop new products and come up with solutions. In the past, Microsoft was a place known for its ruthless culture. Spearheaded by founder Bill Gates, Microsoft demanded a lot from its employees and cultivated a hostile workplace. Under the leadership of Satya Nadella, however, Microsoft encourages a growth mindset. This new attitude allows employees to learn from one another, as well as Microsoft customers. Microsoft’s new approach to work has transformed the workplace as well. Rather than working employees like dogs, Microsoft now encourages its employees to maintain a work-life balance. In addition, the office has been opened, providing more spaces for collaboration and communication. Operating at the forefront of innovation, Google and Microsoft are two of the largest employers in the technology sector. Google employs over 98,000 employees, while Microsoft has almost 135,000 employees. Many of Google’s employees are centered at the Googleplex in Mountain View, California. The remainder are spread across more than 70 offices in 50 countries. Microsoft has 50,294 employees in its home region around the Puget Sound. The remaining employees are located in 646 office sites spread across 109 countries. Google and Microsoft offer generous benefits and make themselves accessible to address any employees concerns that may arise. Both companies are ranked highly on lists of the best places to work. Google is eighth on Glassdoor’s “Best Places to Work” list for 2019, a list voted on by the employees at the companies themselves. Microsoft is ranked 34th on the Glassdoor list. The business world has recognized the efforts of both companies to push innovation and creativity. Comparably.com surveyed employees and wrote a list of the companies with the brightest outlook—Google ranked 10th on this list and Microsoft ranked 12th.